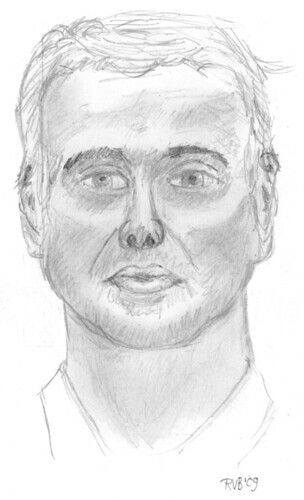 Here’s my fourth attempt in a short period to draw myself from a mirror image. This time I needed more than a few minutes. The self assignment was to find new things in my own face, things I had never seen before. While not completely satisfied with the result, I think it’s a real improvement on earlier versions. I also used a bounding box to get the proportions right. When it came to shading, I had to take off my reading glasses and work with a blurry focus of my eyes on the artwork. The reading glasses just threw me off too much to get the shading at the right position. Recently I heard a podcast episode of Tech Nation by Moira Gunn and David Ewing Ducan, called Evolution of Overconfidence. The discussion was about how having a moderate degree of overconfidence has shaped our evolution as human beings. This got me to thinking about what storytelling actually is. I have struggled with the concept of storytelling and why it is so important. I think I have found some pieces of the puzzle for you. We humans have build a reputation of a species which gets into trouble quite easily, and has a hard time getting out of there. Someone with a more cautious disposition would never rush into dangerous situations as some human individuals seem to do. It is not that we don’t see the danger, but we defy it, even look for places where danger lurks. We praise our heroes, people who found themselves in dangerous situations and had to deal with it. So what has that all to do with storytelling, you might think. Well, not everyone is as brave as some. The world is actually a very dangerous place to be in. It kills people all the time, and we don’t want to die, especially if dying can be prevented. Even the most cranky curmudgeon has at least some willingness to hear about how to survive certain dangers. Of course, there are more ways to die than just physical death. Suppose there exists some unknown danger. It may be that a few individuals have faced this danger, and a couple of them have successfully dealt with it. They might be very willing to share their accounts of what happened, and it might entertain a few of their friends. If, however, there is a storyteller among their friends, who collects the accounts and transforms those into a single story with mythical proportions, the original accounts might reach more people. The story will not be as true to the facts as the original material, but the gist of conquering a danger and how it was done (in general terms) is still intact. Seen in that perspective storytelling becomes something to take away fears and doubts that live in people’s minds. Everyone has had bad experiences, but a good story will explain how to deal with a bad situation, make you more confident to face danger, even if it is not as heroic as the hero in the story. The point I want to make here is that stories help people to cope with danger and overcome it. There is no doubt in my mind that this character trait of sharing stories is as old as humanity, and in some ways has altered the course of human evolution, making humans the most successful of the big animals on this planet. And don’t think we didn’t have competition. From what we know now, Homo Sapiens sapiens wasn’t the strongest of the bunch, or even had the largest brain. I just think we got lucky and managed to survive a (hypothetical) near-extinction by believing the future will be better for our children, and our children’s children. Those who didn’t, didn’t leave any offspring. Storytelling is one of the reasons why we humans still move around, against all odds. At least, that is what I think. If you think that’s hogwash, please share by commenting. I’d love to read your side of the story. While I was reading René Goscinny’s biography 1, some ideas popped up in my head. I first put them on Twitter, but someone asked me to put them on my blog, for easy reference. So here they are. When I read how powerful publishers were in rejecting books and other publications in the past, I can understand how powerless they must feel now. They still cling to the old beliefs that allowed a few individuals to determine what the masses got to read, under guise of “culture”. Not that everything that is published now is suited for everyone, but that is just the point. It is meant for a few readers, not the masses. It’s a bit like the early days of publishing, where books where made for a handful of people, because they were the only ones able to read. Nowadays as a creator you still want your publications to go to a handful of people, those who want to read your works, because they like it. Why not make works that are suitable for the masses? Answer: lowest common denominator. Mass appeal means less specific content. There are those who believe that in a few years the good stuff will be established and the bad stuff will go away. That is old school think. No, I believe the true explosion of creativity is still to come, after which everyone will create some kind of content, all 6+ billion people. This will wash away the old structures of publishing, based on scarcity. New structures will emerge, based on individual preference. Until then we’re in this gray area, which we call the World Wide Web, forefront of things to come. We are writing history here! Dutch: Goscinny : Bedenker van Asterix’ avonturen (bol.com link). 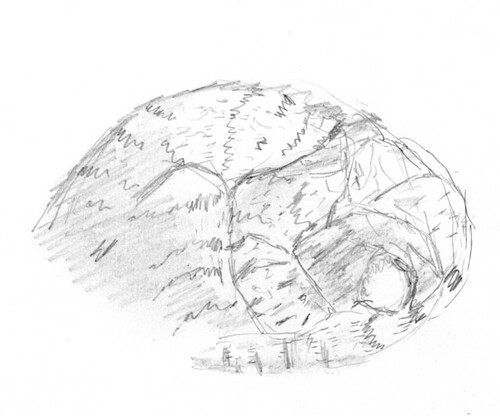 I decided to draw one of my cats sleeping. After all, good illustrations are often based good life drawings of similar subjects. Some things in drawing are just hard, like going from a basic setup to a full-featured sketch. I guess that requires years of good training and not a few days of trampling around with his pencil by some person who thinks he can draw. Well, at least the drawings are getting better. They are still replicas of the originals, though, and not originals themselves. The problem still is that I can’t imagine a 2D shape as a 3D form. Getting some kind of “wire frame” in my head seems impossible. Who knows, maybe it is indeed impossible for me. That is worrisome, because I’m already having problems telling stories. What is there left to do for someone who wants to draw comics if he can’t tell original stories and can’t draw original art? In case you were wondering where part 8 is, I’ve published that on twitpic. While on the surface most of these faces look very much alike, in reality they are different, too different for my critical eye. I guess it is important to draw on model, especially in animation drawing. This is I think the third sheet of egg shaped smiling faces I did since my previous post. One could say, get on with it, just go to the next exercise. However, I think being able to draw consistently is an important distinction between drawing for leisure and drawing more seriously (or even professionally). I’ve got to figure out this “draw on model” thing. One of the things I’m struggling with is the precise shape of the egg form. The best I can come up with is to start with putting light pencil markings where the top and bottom of the egg shape is, and where the widest points left and right are. Again, this is not enough. You also have to imagine how the shape looks if it were a three dimensional form, a true egg, like you buy at the grocery store. After all, you want to draw the egg shape from all sides, and fill it with the features in correct perspective. Perhaps I should use a real egg and do some sketches from different angles to get a better feel for egg perspective. 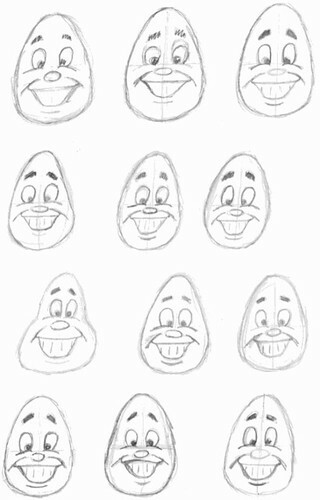 I could even imagine drawing a face on a hard boiled egg, and draw that as well on paper. Wrapping my head around seeing flat images as three dimensional is hard. For instance, when I study my cat’s heads close up, I try to imagine how the head would look from a different angle. Then I check to see if I was right. Sadly, I’m mostly wrong at this point. I can only hope something will “click” at some point and turn on the 3D-light. 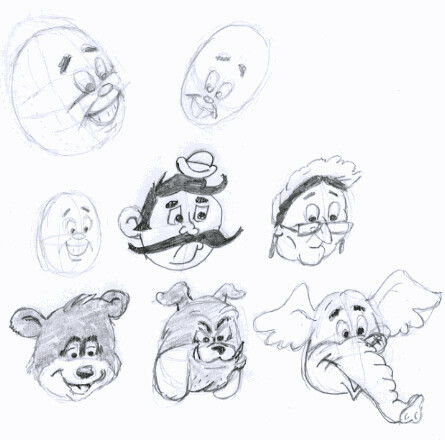 When I was drawing those Preston Blair head shapes, I was wondering what makes a shape like that tick, how can you best see an ellipse, egg shape and pear shape through the artist’s eye? Well, an ellipse is straight forward. That is an elongated circle. An egg shape is based on an elongated circle, but it is elongated more on one side than the other. Furthermore, the more elongated side is thinner and the less elongated is fatter than a comparable ellipse. A pear shape is like an egg shape, but with a pinch in the more elongated side of the shape. This pinch makes the already thinner side even thinner, and the fatter side gets even fatter. 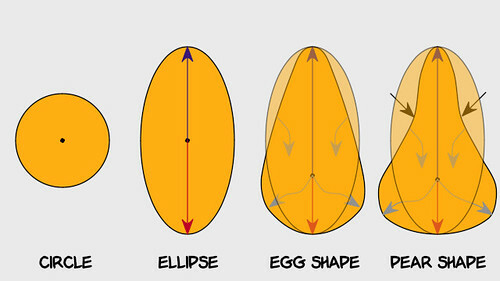 So an egg shape is just a special case of a pear shape, while an ellipse is a special case of an egg shape, and a circle a special case of an ellipse. Of course, by logic, a circle is also a special case of a pear shape.